The DF-15 family offers a variety of strategic implications for the People’s Republic of China. Tested heavily during the 1995/1996 Taiwan Strait Missile Crisis, it is apparent that the DF-15 missiles are often used as a deterrent from Taiwan seeking independence. [xiii] This is further noticeable by the DF-15C which is designed to attack underground military targets such as hardened military facilities located in Taiwan. According to one estimate by the RAND Corporation, the PRC’s DF-15 stockpile alone is nearly double the size needed to eliminate Taiwan’s attack aircraft infrastructure. [xiv] The extended range on the DF-15A allows China to expand their strike range beyond Taiwan, reaching as far as South Korea and parts of northern India. [xv] If relocated elsewhere along the PRC’s border, the DF-15B variant is capable of reaching Kadena Air Base, Japan to the east,[xvi] and New Delhi, India to the southwest. 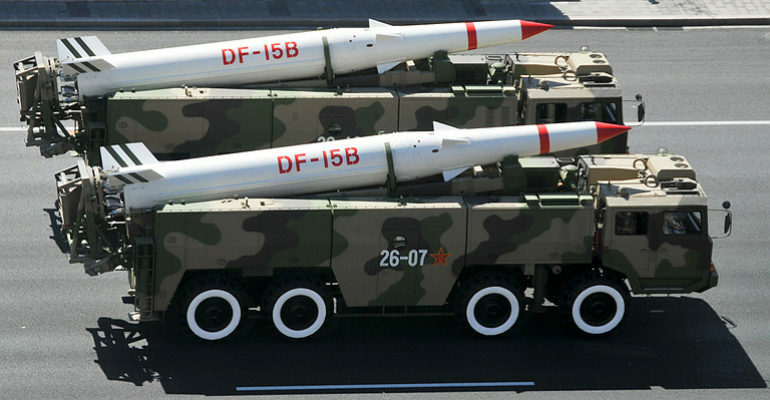 [xvii] Thus, the DF-15 remains a versatile component of the PRC’s rapid attack and anti-access/area denial capabilities. [vi] Office of the Secretary of Defense, Military and Security Developments Involving the People’s Republic of China. [xiv] Jane’s Intelligence Review, “Power posturing – China’s tactical nuclear stance comes of age,” IHS, August 12, 2010, https://janes.ihs.com/Janes/Display/1196044. [xv] Heginbothan, The U.S.-China Military Scorecard, p. 47. [xvi] Heginbothan, The U.S.-China Military Scorecard, p. 61.